Lapis is an opaque gemstone, slightly softer than quartz crystal with a strong fluorescence under black lights. Lapis is composed of an amalgam of several minerals: lazurite, augite, calcite, diopside, enstatite, mica, hornblende, nosean, sodalite, and often pyrite. Lapis activates the throat and third eye chakras, stimulates impulses toward physical, emotional and mental purity, and helps to overcome depression and enhance states of serenity. Lapis assists in balancing male and female energies within ourselves. 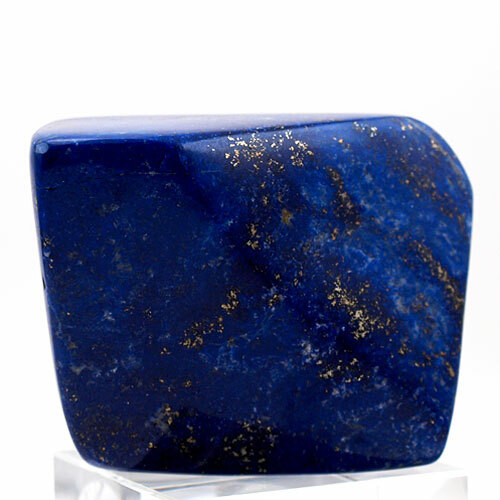 For more information read the Lapis Lazuli section of our Crystalpedia.